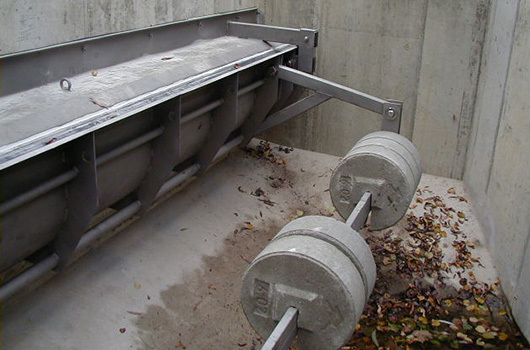 The ACU-BEND Bending Weir System is designed to maintain maximum water levels upstream of the weir, thus allowing full usage of all the available upstream storage volume, while not adversely affecting the overflow weir capacity in Combined Sewer Overflow (CSO) applications. 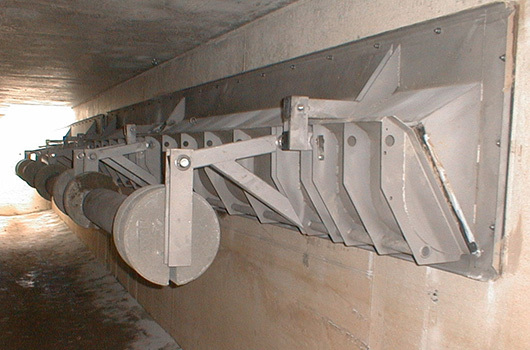 The ACU-BEND’s unique, patented and extensively tested design operates by only allowing any excess water in the system to reach the receiving stream but only after the design upstream water level is reached. This increases the tank and sewer storage volume and reduces the frequency and volume of overflow events, resulting in a decrease in water pollution. This allows the ACU-BEND to overcome the fixed weir’s inherent disadvantages. The ACU-BEND can also create an airtight seal which protects against backflow and controls odor as it is normally in the closed position. The only mechanical components of the system consist of sleeve bearings requiring no lubrication; therefore the need for maintenance is reduced assuring economic and trouble free operation. The ACU-BEND’s compact design allows for easy installation in new overflow structures or can be easily retrofitted directly over existing fixed weirs. The following components are included in the ACU-BEND Bending Weir System: the bending weir flap, the sleeve bearings, the anchoring system, the counterweights and the inclinometer. The ACU-BEND Bending Weir can vary from a model GAB-30 to GAB-90. The GAB-30 is designed to hold back 12 inches (30 cm) of water over the weir crest and the GAB-90 holds 36 inches (90 cm) of water over the weir crest. The ACU-BEND’s model selection is based entirely on the height of the storage water required. The units are modular in design with a single unit being up to 20 feet (6 m) long. The hydraulic capacity of the ACU-BEND is at least equal to that of a standard overflow weir. The ACU-BEND bending weir is installed on the downstream side and directly over the entire length of the overflow weir opening. The ACU-BEND bending weir accommodates the overflow by pivoting at the top and swinging open from the bottom. 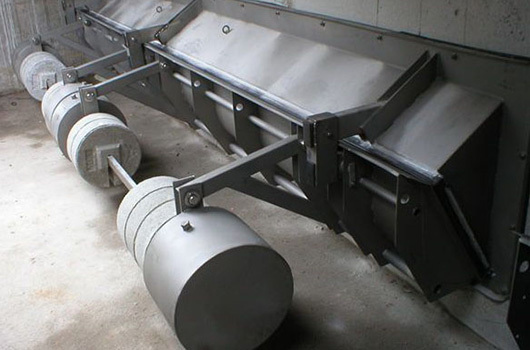 The bending weir mechanism is entirely passive and does not require any external energy for operation. 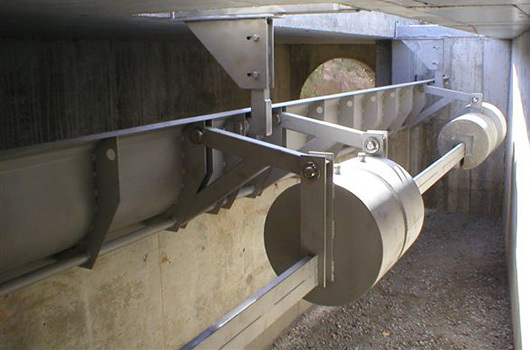 The fixed counterweights act directly against the bending weir flap to maintain a constant upstream water level for all overflows varying from 0 to the design flow. The ACU-BEND bending weir will also accommodate flows greater than the design flow with a resultant increase in the water level. The operating level can easily be adjusted on site by adding or removing counterweights. 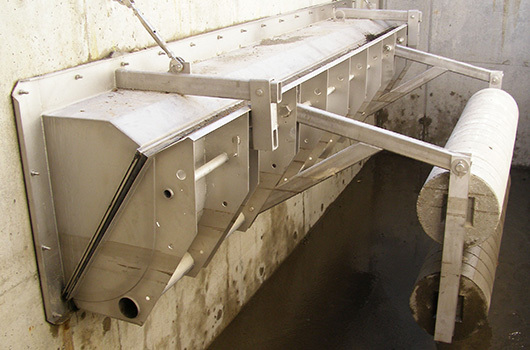 The bending weir consists of a structural frame fixed to the overflow weir wall, a flap and an integral counterweight structure. The ACU-BEND bending weir does not require any controls, however operation may be monitored by an inclinometer. The upstream and downstream water levels may also be monitored. The ACU-BEND bending weir accommodates the overflow by swinging open from the bottom. As a result, some float materials are retained upstream of the bending weir. They are returned to the sewer floor at the end of the event, where they will be transported by the dry weather flow to the waste water treatment plant for collection and removal.